In part one of our two-part series, we spoke briefly about some of the countless benefits you can expect to experience when joining a fitness club. From meeting new people and achieving your fitness goals to continue building your self esteem, there are a number of reasons why individuals choose to lead active lifestyles. During part two of our multi-part series, we will be highlighting a few more of the reasons why you should make finding a quality fitness club your New Year’s resolution! Seung-Ni Fit Club is the leading fitness center in Michigan. We know that you are looking for the most in convenience, which is why we offer a number of different classes at our fitness clubs in Midland, Bay City, Traverse City, Saginaw, and more. With instructed fitness classes like body sculpting, kickboxing, and zumba, we know that you will be able to find a class that will fit your needs. If you are thinking about joining a fitness club, but would like to learn the benefits that you stand to gain, continue reading more below. By simply taking part in frequent exercise, you can reduce the risks of hypertension while simultaneously lowering your blood pressure. In fact, according to the Mayo Clinic, “becoming more active can lower your systolic blood pressure — the top number in a blood pressure reading — by an average of 4 to 9 millimeters of mercury (mmHg). That’s as good as some blood pressure medications.” With lower blood pressure comes the reduced risk of heart problems, stroke, improved vision, and improved kidney health. As you can see, frequently exercising can contribute to many positive healthy benefits, which many begin to notice within their first few trips to the gym! By routinely visiting the gym, you can help yourself immensely while unknowingly building good habits. Setting a strict workout schedule can help you develop self-discipline, which you can use to your advantage during your day-to-day life. You may even notice that you are able to face problems calmly and collectively when you may have not been able to otherwise. It’s no secret that working out can drain your energy levels. However, this isn’t necessarily a bad thing. Similar to a battery, your body is fully energized at the start of your day. However, spending time sitting in an office or on your couch does little to deplete your body’s energy. It’s no wonder why many individuals have difficulty falling asleep at the end of the day after expending little to no energy while sitting behind a desk. This is why routinely working out can help you achieve the deep state of sleep that you’ve been searching for. 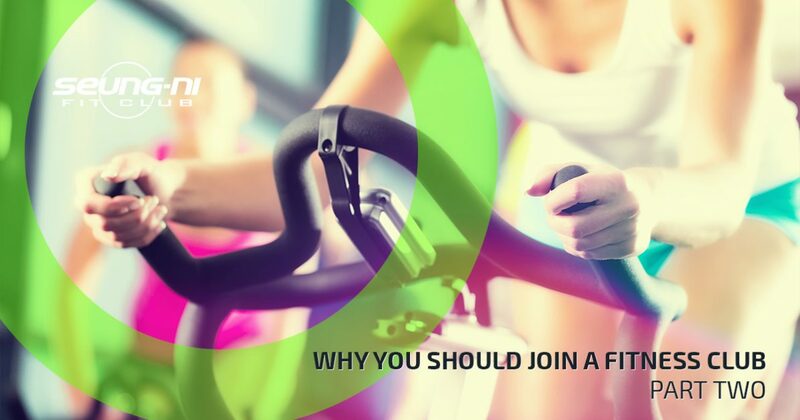 We hope that you enjoyed our multi-part series on the benefits of joining a fitness club. If you are looking for a New Year’s resolution that will continue to pay dividends in health benefits, sign up for your membership at Seung-Ni Fit Club today. We look forward to speaking with you!